On average, paid subscribers to these dating services are spending about $58 per year. And maybe not surprisingly, the more money these daters make, the more tend to spend—with the exception at the highest income bracket. Similarly, the better a dater’s credit score, the more they are spending on dating apps—except for those that identified themselves as having “excellent” credit. Cuffing season, the concept of people more eagerly looking to find a romantic partner later in the year when the weather turns cold, doesn’t exist. According to our data, it seems the attempt to find a partner, if reflected by the number paid dating app subscriptions, is relatively consistent throughout the year—except for small but notable spikes during in July and December. ]Maybe Virginia? We sifted through the data to find the top 10 states with the highest average annual spending on dating services and Virginia tops the list at $143 per month. Virginia is followed by Pennsylvania ($108), New Jersey ($93), Massachusetts ($82), Maryland ($79), Colorado ($77), Georgia ($77), Illinois ($74), Arizona ($71) and North Carolina ($69). Singles—young and old alike—are looking for love. However, while nearly half (46%) of people paying for dating services are between the ages of 25 and 34, older daters are dishing out just a little bit more. 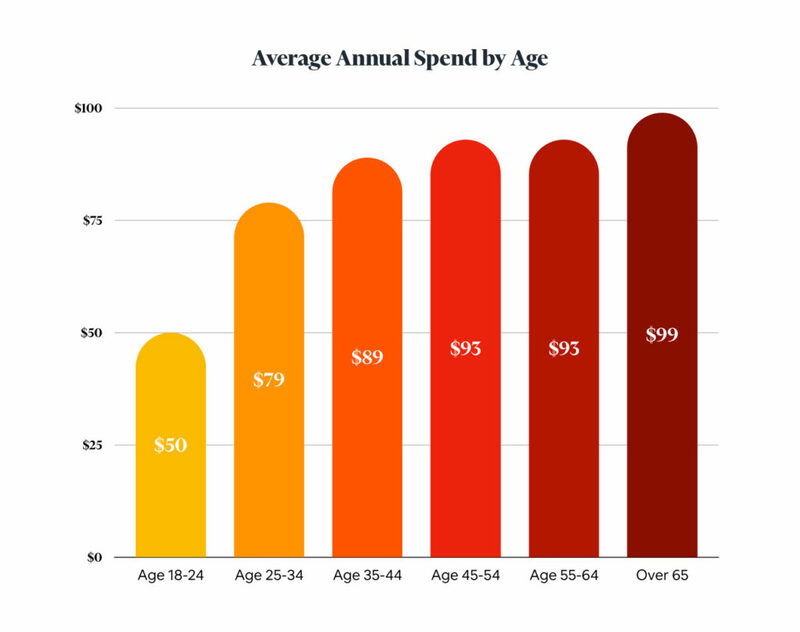 On average, 18 to 24-year-olds are paying about $50 per year and daters over 65 are paying close to double—$99 per year. Based on Trim user transaction data from January 2018 to January 2019.